There's an old sales adage that applies to job hunting which goes something like this: "success is 98% just showing up". I want to expand on the use of technology and how to apply it to your job search. The new rules of modern job hunting change daily as does the technology and counter-technology companies use. Because of that, a traditional staple in the job-hunter's arsenal is coming back into vogue - FAX. Guerrillas know that often the best weapon is "old reliable". I wrote an article for California Job Journal on the use of fax technology as an effective alternative to email, snail mail and web forms. It's well worth reading. 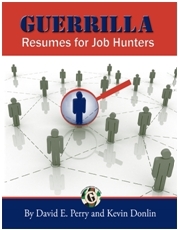 On the Guerrilla Marketing for Job Hunters site there's a free trial offer as well. With Fax your document cuts through all the technology barriers in your way. Fax was pivotal in a successful marketing campaign I ran to place two candidates as a team [no easy feat]. Fax was the KEY distribution tool for the launch which also consisted of direct mail, web site and blog - along with a direct marketing campaign lead by me - to leverage the full power of the Force Multiplier Effect. Without the initial traction from MyFax, it's very likely I would have worked a lot harder to schedule the 39 interviews. With it I simply zeroed in on who had opened the fax as the hottest prospects. The two candidates where successful in closing on 38 offers from the initial round of 39 meetings. Their progress was tracked - in near real time - and podcasted on LandedFM in 3 segments over a 6 week period. Part 1 Part 2 Part 3. As far as tools go it's also worth while looking at the web site he designed and the accompanying Blog. Using one tool in isolation will increase your ability to penetrate the companies you want. Using several of them in tandem has an exponential impact.